Kaidan Marchand, 5, of Gorham, makes a get well card for Ava Winslow, who is battling osteosarcoma, during the Gray-New Gloucester Rallies for Ava fundraiser on Aug. 26. 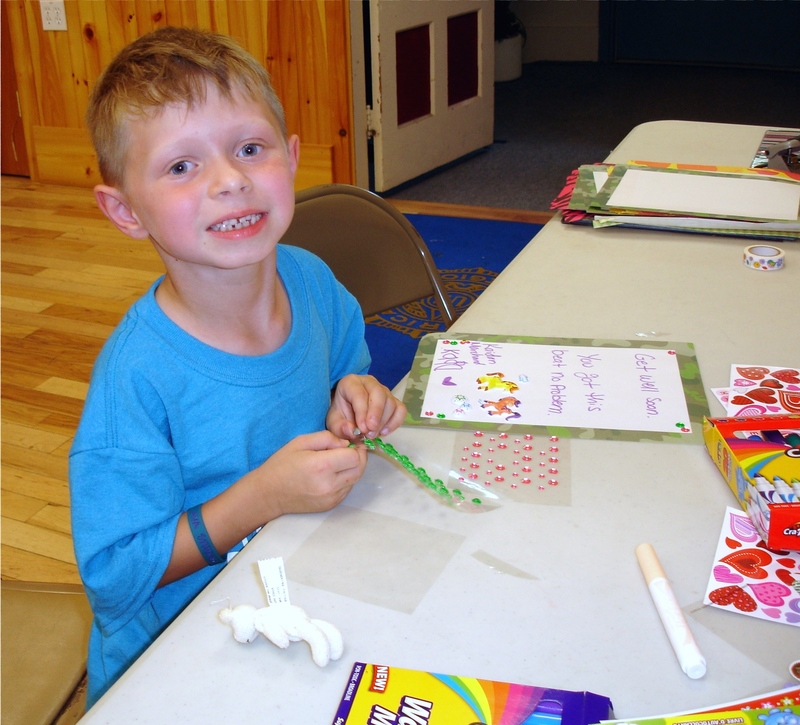 He became acquainted with Ava when they both attended Rise and Shine Childcare and said that she is his best friend. Sabbathday Lake’s Brother Delmer Wilson (1873-1961) launched his photography hobby in 1898 with glass plate negatives and using all types of film through his life, including color Polaroid. At a workshop at Shaker Village on Saturday, Sept. 16, New Gloucester photographer Vicki Lund will show participants how to create a great shot using the features of their digital cameras. She will teach camera operation/functions, use of natural light, composition, raw versus jpeg file formats, and white balance. After a brief class, you will explore the grounds of Shaker Village, photographing along the way, then returning to the class for critique. The workshop will be held from 1-4 p.m. Please bring your camera manual, SD card, fresh batteries and, if you have one, a tripod. Pre-registration is required, and the fee is $50. Class size is limited to 12. Register online at www.maineshakers.com/workshops or call 926-4597 to reserve a spot. Join the fun at Shaker Village for the end-of-season Fall Harvest Festival, from 10 a.m.-3:30 p.m., Saturday, Oct. 8. 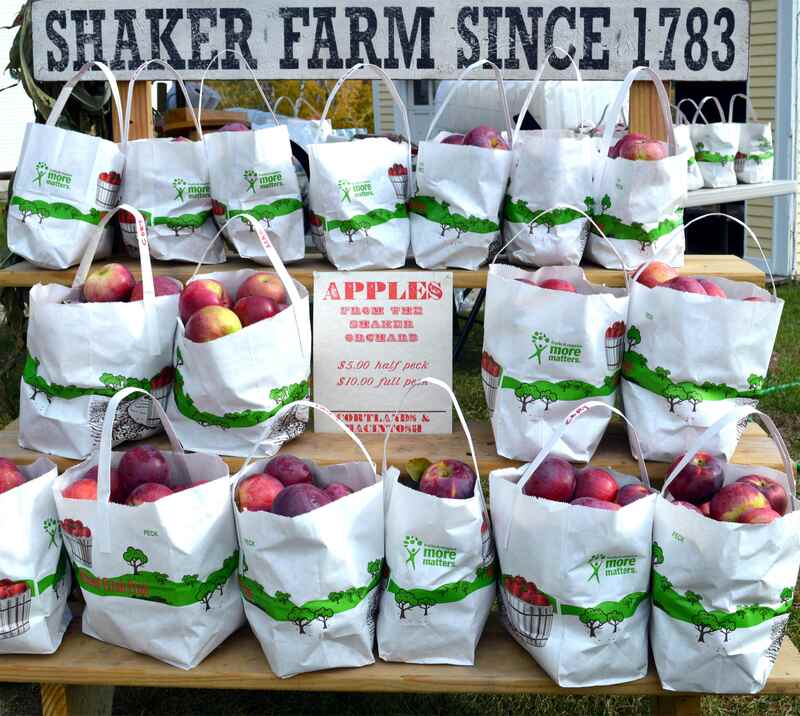 Freshly picked apples from the historic Shaker orchards will be offered for sale along with free cider pressing, homemade Shaker apple fritters and much more. Chipman’s Farm, neighbors to the Shakers since the 1790s, will have a bounty available for sale. Seasonal mums, other late-season bloomers and houseplants will be featured in a booth hosted by Donna’s Greenhouses of New Gloucester. Free wagon rides will be offered throughout the day. Kids will be treated to free face painting and free gourd decorating. All activities will take place on the grounds of Sabbathday Lake Shaker Village and inside the Shakers’ historic 1830 barns. The village is located at 707 Shaker Road, off Route 26, New Gloucester. The festival will be held rain or shine. Two nights of scare are being offered to mature audiences on Friday, Oct. 23, and Saturday, Oct. 24, at Pineland Farms. Make your way through a spooky corn maize to the haunted woods. Flashlights are required. Departure times for both nights are 6 p.m., 6:30 p.m., 7 p.m. and 7:30 p.m. Purchase tickets for $5 per person at The Market and Welcome Center, 15 Farm View Drive, New Gloucester. The second annual Harvest Festival at Pineland Farms promises a day filled with harvest activities for families with children of all ages from 10 a.m.-3 p.m., Saturday, Oct. 24. Ongoing activities feature farmers Olympics, apple cider making demonstration, corn maize, “click clack boo” woods walk, free showings of “It’s the Great Pumpkin, Charlie Brown,” face painting, tractors to explore, and a farm photo booth. The festival admission is $5 per person. Buy tickets at The Market and Welcome Center, 15 Farm View Drive, New Gloucester. For more information, call 650-3031 or email education@pinelandfarms.org. Join Shaker Village for our end-of-season Fall Harvest Festival! Freshly-picked apples from the historic Shaker orchards will be offered for sale along with free cider-pressing; bring your own apples or purchase them at the Shaker Store, homemade Shaker apple fritters, and much more! Chipman’s Farm, neighbors to the Shakers since the 1790s, will have a bounty available for sale, Seasonal mums, other late-season “bloomers” and houseplants will be available from Donna’s Greenhouse. Free, traditional craft demonstrations include Shaker-style broom making by Kent Ruesswick, wool carding, spinning, knitting, and weaving by the R&R Spinners, rug hooking by Parris House Wool Works, blacksmithing by Tim Greene, weaving by Marjie Thompson, wood-turning by Peter Asselyn, Tin type photography by AgNO3 Labs, and wood-carving by the Poland Woodcarvers. Books signing by Don Perkins—Barns of Maine, and Chris Becksvoort—The Shaker Legacy. Free wagon rides will be offered throughout the day. Free face painting for kids along with free gourd decorating! Rain or shine – all above activities will be in the Shakers’ historic 1830 barns. Bring the family! On Saturday, October 10, 2015 from 10:00am until 3:30pm Sabbathday Lake Shaker Village will host its annual Harvest Festival. An afternoon of free barn tours, free wagon rides, and special activities. Freshly-picked apples from the historic Shaker orchards will be offered for sale along with free cider-pressing; bring your own apples or purchase them at the Shaker Store, homemade Shaker apple fritters, and much more! Chipman’s Farm, neighbors to the Shakers since the 1790s, will have a bounty available for sale, Seasonal mums, other late-season “bloomers” and houseplants will be available from Donna’s Greenhouse. Free, traditional craft demonstrations include Shaker-style broom making by Kent Ruesswick, wool carding, spinning, knitting, and weaving by the R&R Spinners, rug hooking by Parris House Wool Works, blacksmithing by Tim Greene, weaving by Marjie Thompson, wood-turning by Peter Asselyn, Tin type photography by AgNO3 Labs, and woodcarving by the Poland Woodcarvers. Books signing by Don Perkins—Barns of Maine, and Chris Becksvoort—The Shaker Legacy. Free wagon rides will be offered throughout the day. Free face painting for kids along with free gourd decorating! Rain or shine – all above activities will be in the Shakers’ historic 1830 barns. Bring the family!